Diane Joyce Humetewa (/ˌhuːməˈteɪwə/ HOO-mə-TAY-wə; born December 5, 1964) is a United States District Judge of the United States District Court for the District of Arizona and was the United States Attorney for the District of Arizona, serving in that position from December 2007 to August 2009. Confirmed in 2014 as the first Native American woman and enrolled tribal member to serve as a federal judge, Humetewa is one of three Native Americans in history to serve in this position. Humetewa is also a Professor of Practice at Arizona State University's Sandra Day O'Connor College of Law. 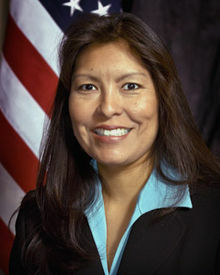 Humetewa has served as counsel to the Senate Committee on Indian Affairs and to the Deputy Attorney General for the United States Department of Justice, as a member of the United States Sentencing Guideline Commission, Native American Advisory Committee, and as an Appellate Court Judge for the Hopi Tribe, of which she is an enrolled member. An enrolled member of the Hopi tribe, Humetewa received her Juris Doctor in 1993 from the Sandra Day O'Connor College of Law at Arizona State University. Beginning in 1996, she served as the Tribal Liaison in the office of the United States Attorney for Arizona. From 2001 to 2007, she served there as Senior Litigation Counsel. In January 2007 Humetewa was recommended as a United States attorney by both of Arizona's senators, John McCain and Jon Kyl, nominated by President George W. Bush in November, and was confirmed by the United States Senate and sworn in as the United States Attorney for the District of Arizona on December 17, 2007. The investiture for Humetewa was held on February 6, 2008 at the Sandra Day O'Connor Courthouse in Phoenix. She is the first Native American woman to serve as a United States Attorney. Humetewa was the permanent successor to Paul K. Charlton, whose dismissal on December 7, 2006 was a prominent aspect of the dismissal of U.S. attorneys controversy in the Bush administration in early 2007. Daniel G. Knauss served as interim United States Attorney for one year after Charlton's dismissal. During that period, Knauss and Humetewa continued to pursue the criminal investigation of Congressman Rick Renzi (R-AZ), begun by Charlton in September 2006. Renzi was indicted by the United States Attorney's office on February 22, 2008. A graduate of the Indian Legal Program at the ASU college of law, Humetewa is considered a national expert on Native American legal issues; she has instructed law enforcement and prosecutors on this topic. From 2002 to 2007, she served as a judge pro tem on the Hopi Tribal Appellate Court, and as an ad hoc member of the Native American Subcommittee of the United States Sentencing Commission. Humetewa resigned effective August 2, 2009 when President Barack Obama nominated Dennis K. Burke as the next United States Attorney for the District of Arizona. She was appointed in 2011 as ASU's Special Advisor to the university president for American Indian Affairs and Special Counsel in the Office of General Counsel at ASU. On September 19, 2013, President Obama nominated Humetewa to serve as a United States District Judge of the United States District Court for the District of Arizona, to the seat vacated by Judge Mary H. Murguia, who was elevated to the United States Court of Appeals for the Ninth Circuit on January 4, 2011. Humetewa was one of four Arizona judicial nominees announced by Obama that day who were chosen in consultation with Republican senators John McCain and Jeff Flake. On February 27, 2014 her nomination was reported out of the Senate Judiciary committee. On May 12, 2014 Senate Majority Leader Harry Reid filed for cloture on the nomination. On Wednesday May 14, 2014 the Senate voted on the motion to invoke cloture by a vote of 64–34. Later that day the Senate voted 96–0 for final confirmation. She received her judicial commission on May 16, 2014. Following the death of Justice Antonin Scalia in February 2016, Humetewa was mentioned as a possible consensus nominee for a vacancy on the United States Supreme Court, considered able to make it through the Republican-controlled Senate. Humetewa is an enrolled member of the Hopi Nation. She is the daughter of Donald A. and Ella Mary Humetewa. ^ "Senate Confirms First-Ever Native American Woman As Federal Judge". Huffington Post. May 15, 2014. ^ Bendery, Jennifer (May 15, 2014). "Senate Confirms First-Ever Native American Woman As Federal Judge". www.huffingtonpost.com. Huffington Post. Retrieved 18 February 2015. ^ "Sandra Day O'Connor College of Law". apps.law.asu.edu. Retrieved 2015-10-02. ^ a b c Sandra Day O'Connor College of Law (2007-12-17). "Alumni spotlight: Diane Humetewa". Sandra Day O'Connor College of Law. Retrieved 2008-12-16. ^ a b "Diane J. Humetewa sworn in as United States Attorney" (PDF). United States Department of Justice. 2007-12-18. Archived from the original (PDF) on 2008-05-20. Retrieved 2008-02-22. ^ "Do the right thing, Dems: Confirm Humetewa, now". East Valley Tribune. 2007-11-19. Archived from the original on 2007-06-24. Retrieved 2008-02-22. ^ a b c d "Humetewa, Diane Joyce – Federal Judicial Center". www.fjc.gov. ^ "U.S. Attorney announces resignation" (PDF). United States Department of Justice. 2009-07-28. Archived from the original (PDF) on 2009-08-10. Retrieved 2009-08-08. ^ McCain, United States Senator John. "United States Senator John McCain". www.mccain.senate.gov. ^ "Presidential Nominations Sent to the Senate". 19 September 2013. ^ Wingett Sanchez, Yvonne; Nowicki, Dan (September 19, 2013). "Obama nominates 4 Arizonans to fill U.S. District Court vacancies". Arizona Daily Star. Retrieved May 16, 2014. ^ "Executive Business Meeting". United States Senate. Committee on the Judiciary. Archived from the original on 5 March 2014. Retrieved 27 February 2014. ^ "U.S. Senate Roll Call Votes 113th Congress – 2nd Session". Vote Summary: Vote Number 146. United States Senate. Retrieved 14 May 2014. ^ "U.S. Senate Roll Call Votes 113th Congress – 2nd Session". Vote Summary: Vote Number 149. United States Senate. Retrieved 14 May 2014. ^ Theobald, William V. (February 18, 2016). "Advocate: Arizona judge perfect Supreme Court nominee". The Arizona Republic. Retrieved February 20, 2016. ^ Stern, Ray. "Diane Humetewa, Hopi Indian From Arizona, Makes History as New Federal Judge". Retrieved 2015-08-13. Diane Humetewa at the Biographical Directory of Federal Judges, a public domain publication of the Federal Judicial Center. This page was last edited on 10 April 2019, at 13:06 (UTC).